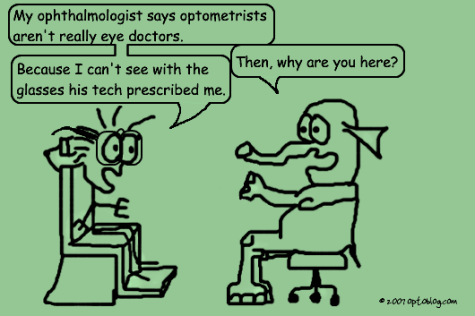 There seems to be a small percentage of ophthalmologists that are vocal against optometry. This is unfortunate because most ophthalmologists work very well with optometrists and enjoy a fruitful relationship with co-management and referral networks. But I know of a couple ophthalmologists who actively poison their patients against optometrists, especially their Medicare patients. Sure, when they eventually need cataract surgery, they’ll end up in the OMD’s office. If they get diagnosed with certain forms of AMD, then they’ll need a retinal consult. Otherwise, the O.D.s should manage most everything they see. There are medical models for this. If you get rectal bleeding, do you automatically go to the proctologist? No, you go to your family practice physician. He’ll tell you either: 1) You just ate way too many nuts last night or 2) You’ve got a serious problem that requires more testing and a proctology consult. So, optometry is the primary eyecare profession, and OMDs would do well to play nice, or we’ll send our referrals to someone who will. Anyway, the above cartoon is based on a true story. Many OMDs delegate their refractions to their ophthalmic technician. Sure, if you play the averages, then it’s not going to come back to bite you a lot. You’ll recall that in optometry school, we had multiple courses on how to not only do a refraction, but also how to analyze binocular testing data and adjust the Rx accordingly. It’s important to know what symptoms and signs would lead you to do a binocular testing battery, and I don’t think techs are trained for that. I once observed an ophthalmologist just off his refractive surgery fellowship and starting a new job. He was getting a lesson from his tech about how to use the phoropter. Seriously, can’t ophthalmology residencies spend some course time on this stuff? Would it kill an OMD to at least do a binocular balance instead of just Rx-ing monocular subjective best VA? You may be surprised to know that there are good and bad in all occupations including Optomitrists, Ophthalmologists, and Ophthalmic medical assistants (certified). You were right in stating we should all play nice and then you went on to threaten that you will send your referrals elsewhere. I am part of a group of Ophthalmic technicians (35 of us in one practice) and we rarely have any remake/glasses checks. We perform binocular balance and constantly work to improve our skills. With 130,000 exams annually you would be surprised at how good we are with daily practice and volume that you would only dream of. There are eye centers out there at academic centers that would leave you speachless when it comes to quality and volume performed by little ole eye techs.